MSE Creative Consulting Blog: Stilts? The story begins, "With the world losing the battle against global warming so far, experts are warning that humans need to follow nature's example: Adapt or die. That means elevating buildings, making taller and stronger dams and seawalls," et cetera. As usual, the writer does not provide any evidence that we are "losing the battle...so far." Lets take a look at the data. 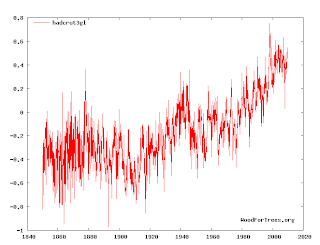 Here is the British temperature data for the last 150 years. 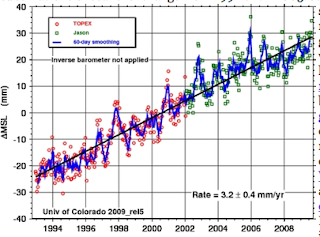 Note that temperatures peaked in 1998 and have cooled, slightly, since then (click on graph to enlarge). AP goes on to talk about "stilts" because of rising sea levels. 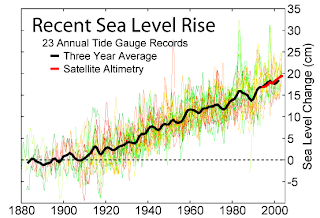 Global warming proponents usually point to this sea level graph, periodically updated by the University of Colorado. Looks alarming. Sea levels have been rising since the end of the Little Ice Age. There is nothing particularly remarkable about recent rises.